Step 2What is foreign exchange market? Step 4How to look at foreign exchange rate. Step 6What are the moving factors of foreign exchange rate? 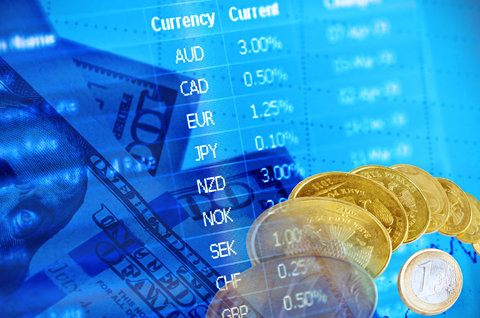 “Foreign exchange” means exchange of currencies (US dollars and Yen, Euro and Yen, US dollars and British Pound etc.). And “Foreign exchange rate” means the price of that exchange. When we go abroad for a holiday, we exchange Yen to US dollars for example. And “Foreign exchange rate” is the price between the two currencies such as 1 dollar equals 100 yen. “Foreign exchange rate” indicated in a bank building is fixed for the whole day but it is moving 24 hours in the foreign exchange and FX markets. 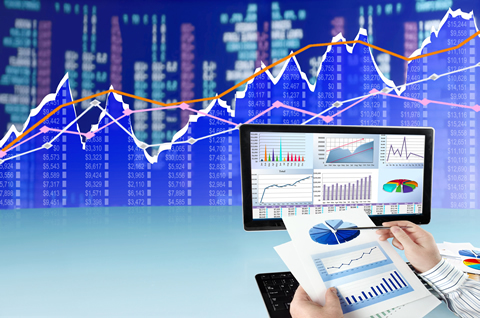 Foreign exchange market is not a fixed market place such as an exchange. 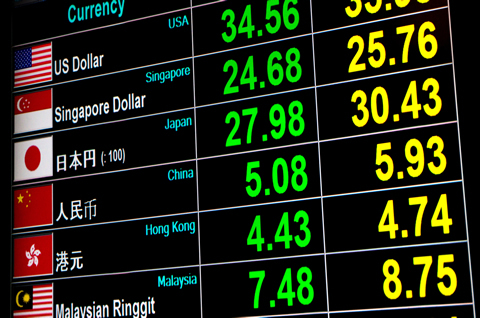 Foreign exchange is being traded one on one between the market participants such as banks, security companies, foreign exchange brokers and central banks using networks created by phones and computers. The market where only financial institutions participate is called “Interbank Market” and the market where banks and security companies trade with their clients (corporations, institutional investors and individual investors etc.) is called “Customer Transaction Market”. And the change in foreign exchange law in 1998 allowed individual investors to enter foreign exchange market who could only trade foreign exchange through products such as foreign currency deposits before. Foreign exchange is traded world-wide and it’s a huge market with time and price of global sequence. So it is possible to trade 24 hours except for weekends (Saturday and Sunday) and New Year Day when financial institutions of become closed. Transactions are most active during the business hours of financial institutions of each country. If you follow one day movement of the foreign exchange market, it starts with Sydney and moves onto Japan and Asia, Middle-East, Europe like UK and Germany then finally to US. The market is seamless and continues 24 hours like a relay. New York, London and Tokyo are called biggest three markets where transactions are most active. Foreign exchange market never sleeps but transactions stop when the participating financial institutions are on holiday such as on weekends and New Year Day. Foreign exchange rate is indicated like 1 dollar is equal to “100.00-07” but it does not mean that it can be traded between 100.00 and 100.07. The rate means 1 dollar can be sold at 100.00 and bought at 100.07. The former is called bid and the latter is called ask. This way of quoting both prices is called “Two way price” or “Two way quote” and it is the most popular quotation method. Strong yen and weak yen indicates the change in value of yen relative to foreign currencies. The value of yen rising against the other currency is described as strong yen and falling against the other currency is described as weak yen. For example when a Japanese person imports a product priced at 500 dollars, he would have to pay 50,000 yen if the exchange rate is 100 and 55,000 yen if the exchange rate is 110. If a dollar moved from 100 to 110, it means yen has lost its value and you have to pay 5,000 yen more to purchase a product priced at 500 dollars. Weak yen is same as strong dollar in terms of relationship between dollar and yen. In this example an American person exporting a product priced at 500 dollars can receive 5,000 yen more. According to a text book explanation, foreign exchange rate is decided by supply and demand of the various market participants trading for various reasons. But to put it more simply, the reason for trading exchange is to avoid a loss or make money. The basic rule for making money in FX is to hold the currency of a strong country and abandon the currency of a weak country. 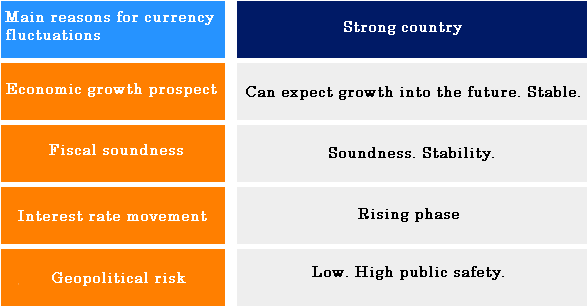 A strong country is a country where its economy will expand into the future (or be stable at high levels) and politically stable. Market participants look for a strong country by checking interest rates and economic prospects, sound fiscal policies and geo-political issues like war and terrorism. On the contrary the currency of a weak country are sold. 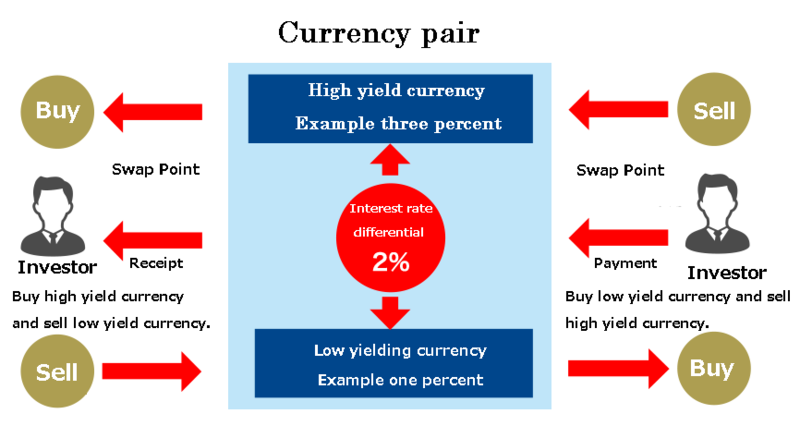 Swap points are created by the interest rate difference of two countries and are equivalent to interests on foreign currency deposit. To buy 100,000 US dollars in FX transaction is same as borrowing yen equivalent to 100,000 US dollars (10,000,000 yen in case of a dollar at 100) from the interbank market and investing into US dollars. In the case of borrowing yen equivalent to 100,000 US dollars, you need to pay interest in yen (for example 0.1% annually) but at the same time you receive interest in US dollars like a foreign currency deposit (for example 2% annually). If the receiving interest rate (2% annually) minus the paying interest rate (0.1% annually) is plus (1.9% annually), then that difference (swap points) can be received on daily basis. On the contrary if it is minus then swap points are paid annually. Swap points are calculated for unsettled positions as of New York closing (Tokyo time 7AM, 6AM in summer time) rolling over one day automatically. There will be no swap points when the position is closed and not carried over into the next day. Number of days for calculating swap points may differ due to holidays in various countries but the basic pattern is three days for an open position carried over the weekend and one day for ordinary business days.